Confederated Tribes of the Chehalis Reservation 833 4,215 Southeastern Grays Harbor County and southwestern Thurston County. Colville Indian Reservation 7,587 1,400,000 Primarily in the southeastern section of Okanogan County and the southern half of Ferry County. Hoh Indian Reservation 102 443 The Pacific Coast of Jefferson County. Jamestown S'Klallam Indian Reservation 594 12 Near Sequim Bay, in extreme eastern Clallam County. Kalispel Indian Reservation 470 4,629 The town of Cusick, in Pend Oreille County. Lower Elwha Indian Reservation 776 991 The mouth of the Elwha River, in Clallam County. Lummi Indian Reservation 6,590 21,000 West of Bellingham, in western Whatcom County. Makah Indian Reservation 1,356 27,950 On Cape Flattery in Clallam County. Muckleshoot Indian Reservation 3,300 3,850 Southeast of Auburn in King County. Nisqually Indian Reservation 588 4,800 Western Pierce County and eastern Thurston County. Nooksack Indian Reservation 1,800 2,500 Town of Deming, Washington in western Whatcom County. Port Gamble Indian Reservation 1,234 1,301 Port Gamble Bay in Clallam County. 7,486 Western and northern shores of Port Madison, northern Kitsap County. Puyallup Indian Reservation 4,000 18,061 Primarily northern Pierce County. Quileute Indian Reservation 371 1,003.4 Southwestern portion of the Olympic Peninsula in Clallam County. Quinault Indian Nation 2,535 208,150 Primarily the north coast of Grays Harbor County. Samish Indian Reservation 1,835 79 (Samish also owns another 130+/- acres of non-trust land) Anacortes. Sauk-Suiattle Indian Reservation 200 96 Near Darrington in southern Skagit County. Shoalwater Bay Indian Reservation 70 334 Along Willapa Bay in northwestern Pacific County. Skokomish Indian Reservation 796 5,000 Just north of Shelton in Mason County. Snoqualmie Indian Reservation 650 56 Snoqualmie Valley in east King and Snohomish Counties. Spokane Indian Reservation 2,708 154,898 Almost entirely in southern Stevens County and in northeastern Lincoln County along the Spokane River. Squaxin Island Indian Reservation 936 1,979 The entirely of Squaxin Island and the town of Kamilche in Mason County. Stillaguamish Indian Reservation 237 40 Along the Stillaguamish River in Snohomish County. Swinomish Indian Reservation 778 7,169 The southeastern side of Fidalgo Island in Skagit County. Tulalip Indian Reservation 2600 11,500 Port Susan in western Snohomish County. Upper Skagit Indian Reservation 200 99 Western Skagit County near the towns of Sedro-Woolley and Burlington. Yakama Indian Reservation 10,851 1,372,000 Primarily in southern Yakima County and in the northern edge of Klickitat County. 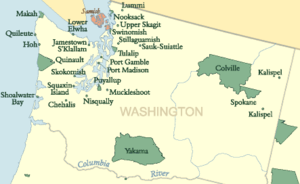 ^ "Land Area of Tribal Reservations in Washington State" (PDF). Washington State Department of Transportation. "Indian Entities Recognized and Eligible To Receive Services From the United States Bureau of Indian Affairs" (PDF). Federal Register. Washington, D.C.: Office of the Federal Register, National Archives and Records Administration. 80 (9): 1942–1948. January 14, 2015. ISSN 2167-2520. OCLC 70285150. Retrieved November 8, 2015. This page was last edited on 24 November 2018, at 09:12 (UTC).